After a long hike across boggy ground and through thick pine forests, clutching pepper spray to protect against bear attacks, Sarah Parcak and her small team of archaeologists stood on an exposed, wind-blasted headland in North America. Exhausted but happy, they had been led to Point Rosee in Newfoundland by the most high-tech weaponry in the modern archaeological arsenal - satellite data captured 383 miles (600km) above the Earth. But once here they were back to using trowels and brushes. I joined them to see how this powerful combination of new and old allowed them to make what could be a seismic discovery. We were here on the trail of one of the greatest maritime cultures of all time. We were here inspired by ancient chronicles which many have written off as fairy stories. We were here looking for Vikings. In about 800AD Britain felt the fury of these men from the north. Portmahomack was one of Scotland's most prosperous and important communities. On a protected bay in Easter Ross, on the edge of the Highlands, it was well placed as a waypoint for merchants, travellers and pilgrims moving along the east coast. Recent excavations have given us a picture of a wealthy monastery at its heart. Scriptures were copied on to carefully prepared animal skin parchment by monks, skilled craftsmen created beautiful, jewel-encrusted religious ornaments, sculptors carved intricate Celtic crosses. Trade was the source of these riches, the sea brought wealth, but the sea also brought destruction. Archaeologists have revealed that Portmahomack was suddenly and utterly destroyed. They found smashed fragments of sculptures mingled with the ashes of torched buildings. The settlement was wiped out. It is impossible to be certain but historians now think the most likely explanation is that it was attacked and looted. When I visited, a couple of months before the trip to Point Rosee, I held a piece of skull in my hand, presumably from a monk. It had been shattered by a mighty blow, the sword's blade left a deep gouge that makes the cause of death clear. Who were these men who slaughtered God's servants and annihilated one of the oldest Christian sites in Britain? Almost certainly they were men who cared nothing for the Christian God, men who came in ships from the north and west, men who sought gold: Vikings. The attack on Portmahomack is the only Viking raid in Britain for which we have archaeological evidence. Others, such as the attack on Lindisfarne at about the same time, echo only through the reports recorded in chronicles. Together these two violent raids mark the start of an era of attacks from across the North Sea. The Vikings or Norse exploded out of Sweden, Denmark and Norway, using hugely sophisticated navigational skills and shipbuilding technology as they pushed ever further into the wider world. Vikings conquered Normandy in France - the land of the Northmen - even parts of Italy and the Levant. They also founded Dublin, made deep inroads into England and island-hopped across the North Atlantic. Orkney, Shetland, Fair Isle and Iceland. They even crossed to Greenland, where I visited stunning Viking sites on the coast, dodging icebergs to get ashore. But perhaps their greatest achievement is the one shrouded in the most mystery. Did they get to North America? If so, was it a fleeting visit or did they colonise that distant coast too, centuries before Christopher Columbus? The descendants of the Vikings left sagas - beautiful works of literature in which fact and fiction are often poetically intermixed. 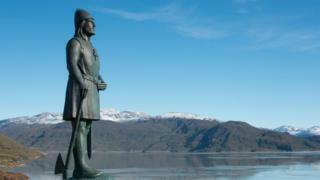 They clearly state that the intrepid Leif Erikson led an expedition to the east coast of North America. They describe good harbours, and an abundance of natural resources. One of the most fascinating mysteries in history is whether these can be believed. In The Vikings Uncovered Dan Snow tracks their expansion west, first as raiders and then as settlers and traders. He travels through Britain, to Iceland, Greenland and Canada to see what could be the most westerly Viking settlement ever discovered. The programme will be on BBC One on Monday 4 April at 20:30. In 1960, a site on the very northernmost tip of Newfoundland in Canada, L'Anse aux Meadows, was investigated and archaeologists were convinced that it was a Viking settlement. The world woke up to the fact that the Vikings had reached North America before any other Europeans. But no other site has been identified, the search for Viking America stalled. Until now. Sarah Parcak uses satellite imagery to look for irregularities in the soil, potentially caused by man-made structures which lie beneath. She has used this technique to find ancient sites in Egypt and a few years ago she scoured the Roman Empire where she identified the site of the great lighthouse at Portus near Rome and several other buildings, from a fort in Tunisia to ramparts in Romania. Last year, she decided to search for the Vikings. It wasn't easy. They travelled light and left nothing behind. No massive stone theatres for them. They voyaged in longships with a strong oak keel, and thin overlapping planks fanning out to form the iconic, graceful hull - the gaps between the planks stuffed with animal hair and tar. The rudder was fixed on with a twisted birch sapling. Sails spun from wool. Food was pickled herring, lamb smoked using reindeer droppings, fermented salmon. Almost everything on a Viking ship would get recycled or rot away. But they did leave a trace, and Parcak's team were determined to pick it up, however faint. They scanned satellite pictures from across the east coast of America. Several sites appeared worth following up, but they had to decide on one for a dig. In the end they opted for a headland, almost the very western tip of Newfoundland, 400 miles further south and west than the only known Viking site in North America. It overlooked two bays, offering protection for ships from any wind direction. Parcak saw oddities in the soil that stood out - patterns and discolourations that suggested artificial, man-made structures, possibly even Viking longhouses, once stood there. It was time to leave the lab, and head out into the field. For a couple of weeks Parcak led the team as they carefully probed the ground that she had first spotted thanks to a satellite hundreds of miles away in space. Newfoundland's climate is as brutal as ours in the British Isles with hail, gales, sweltering sun and driving rain. Exploratory trenches were flooded, equipment blew away, but they toughed it out and found something tantalising. Months before, in her lab, Sarah had shown me an image that she thought might be the site of burning or metalwork. Sure enough, when she started to dig on the exact spot, she found something. Something that might prove to be a breakthrough. Carefully peeling back the layers of earth, she found what seemed to be a hearth. A blackened rock testified to intense temperatures. Beneath it were piles of charcoal mixed with cooked bog iron - an iron deposit that needs to be baked to drive off impurities and allow the iron to be extracted for smelting. Surrounding the hearth appeared to be a turf wall of the kind built by Viking settlers across the North Atlantic. "I am absolutely thrilled," says Parcak. "Typically in archaeology, you only ever get to write a footnote in the history books, but what we seem to have at Point Rosee may be the beginning of an entirely new chapter. "This new site could unravel more secrets about the Vikings, whether they were the first Europeans to 'occupy' briefly in North America, and reveal that the Vikings dared to explore much further into the New World than we ever thought." She immediately checked that there could be no other explanation for these deposits. Newfoundland historian Olaf Janzen was certain, no other groups of settlers roasted bog iron in Newfoundland. Nothing has been proven yet, but it looks like Parcak might have found evidence for Viking exploration in North America that goes much further than just that one site discovered in the 60s. This find "has the potential to change history" says Douglas Bolender, an expert on Viking settlement who has spent 15 years tracking the Vikings across the north Atlantic. "Right now the simplest answer is that it looks like a small activity area, maybe connected to a larger farm that is Norse." He is excited and can't wait to see what further excavation reveals. He's hoping that seeds or other organic matter that can be carbon dated will be unearthed. If Parcak has found evidence of another Viking site, it will ignite a new search for Viking settlements across eastern Canada and New England, perhaps as far south as New York and even beyond. Technology has unlocked long forgotten stories from our past, and that technology is getting ever more sophisticated. For those of us who are fascinated by the travels of the intrepid Norsemen, the next few years will provide ever more inspiration. Vikings warriors were a fierce bunch, trained in archery, spear-throwing and swordplay from the age of 10. The most fanatical warriors were called "berserkers".